Detoxification. There are many dieticians, nutritionists, as well as health food junkies who contend that detoxification diets are the ultimate body cleansing tool. Even though it is true that detoxification diets may contain a great deal of healthy ingredients and can lead to weight loss, do they really work to cleanse the inside of the body? As the never-ending arguments, both for and against detox, go on, it has never been established, or concrete evidence provided, whether or not detoxification is good for the body’s systems. Detoxification basically means blood cleansing through eliminating impurities from the blood in the liver, through kidneys, lungs, intestines, lymph and skin. 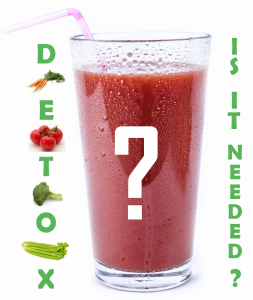 Detoxification – Is It Necessary? Many people contend that there are many benefits to the process of detoxification for the body. Some of those benefits include a healthier immune system, longer life, as well as reducing the risk of contracting various ailments such as the common cold, which, they say, are more likely to occur more frequently in those who do not perform detoxification. However, the same rings true that practicing a healthy lifestyle, including a healthy calorie-controlled diet and regular exercise will lead to weight loss, and help maintain a healthy immune system, again reducing the risk of contracting various ailments such as the common cold. Indeed, many of the people that perform body detoxification systems already do have a healthy lifestyle, so that many would not know if their healthy bodies come from the detoxification itself or the overall healthy lifestyle that they lead. We have debated about whether the benefits of detoxification have really come from the detox process, let’s now look at some other ways that are probably as effective as detoxification (and easier). Studies have shown that taking a daily vitamin and mineral supplement will help better, over time, to improve your memory, boost your immune system, and have an overall healthier body. On the other hand, the advocates of detoxification contend that people can experience these things through their diet. However, government food agencies and health authorities in most countries have continued to advocate for a healthier lifestyle in their campaign to make people aware of the dangers of obesity and its cost, not only to their health but also to the ever-rising cost of treating obesity and health problems directly related to it, not least of which is type-2 diabetes. They also contend that individuals can experience just as healthy a lifestyle as detoxification if they were to eat the right foods, combined with a healthy calorie-controlled weight loss program if wanting to lose weight, and exercise. By changing to a more healthy lifestyle your heart will become stronger, good cholesterol will increase and bad cholesterol decrease reducing the risk of heart attacks or strokes, less ailments will be experienced, and a healthier immune system can be achieved. So, is there difference between the facets of this type of a healthy lifestyle and the detoxification process? I believe there is definitely something to be learned when it comes to detoxification and practising a healthier lifestyle. Chances are that if you continue to eat right, exercise, and take vitamin and mineral supplements if necessary, that you will be just the same, if not altogether better and healthier, than those who advocate total body detoxification. It is definitely worth giving some serious thought to and something that those who are considering using a detox program should check into and research. Regardless of whichever one you choose, first, you have to reduce toxins in your body. If you smoke cut down on cigarettes, better still, QUIT! Reduce your alcohol (unless teetotal), and coffee intake. Stop eating foods such as fast foods, they’re high in saturated fats, and refined sugars (cola and ketchup contain a lot). These all act as toxins in your body and as a hindrance to your healing development. Other factors that should be taken into account are the use of household cleaners that are chemical-based. Personal health care products such as shampoos, toothpaste, deodorants and cleansers should also be reduced. These chemicals are absorbed by the body and will never really be fully eliminated unless care is taken in their use. There are many ways to detox the body, some are listed below. It’s up to you to choose which suits your lifestyle and preference. Starting out on the detoxification diets does not have to be difficult, but it does take hard work, dedication, and discipline to stick with the regimen and diets of the detoxification systems. Drinking only fresh fruits and vegetables such as carrot, spinach, celery, cabbage, apple, pineapple and cranberry (avoid citrus fruits) is an effective way of discharging toxins. It also provides loads of nutrients as well as enzymes to lessen the intensity of the cleansing process to an easy stage. Apart from the detoxification process, fast weight loss is the main benefit from juice fasting although I, personally, wouldn’t recommend it for more than 1-3 days. A person may drop 30-40 lbs on a 30-day juice fast. You are, by now, probably aware that health professionals recommend a gradual healthy weight loss of 1-2 lbs per week. They will also, in all probability, tell you losing excessive amounts of weight per week is not only extremely unhealthy but should only be undertaken under medical supervision and careful assessment. How you approach the fast by gradually reducing food intake before and gradually increasing it after the fast. Your mental approach to how you deal with the discomfort you will probably feel in the early days and its intensity depending on the toxicity in your body. Deciding on the length of fast and how often. These are some of the things that need to be taken into account before embarking on a water fast. Known by many of its advocates as the only “true fast”, as no food of any description is allowed and only pure water is consumed during a water fast. Only water that has gone through some form of purification should be used, or better still, distilled water, which is ideal for water fasting as it binds to toxins but is not recommend for everyday use. One to two quarts should be consumed for every day of the fast. True water fasting, as it contains zero calories, is ideal as an aid to weight loss and it not only eliminates obstruction and aids in self-healing, but also lets the digestive tract and organs to rest completely, allowing all of your energy to self-repair and strengthen damaged organs eliminating toxin build-ups. are there easier ways to detox the body? Yes, there are. Here are some gentler and easier ways to detox your body that you can try out or incorporate them into different methods as part of your routine. As you are now aware, a change of lifestyle and a more healthy diet that includes whole grains, fresh fruits and vegetables, instead of packaged and fast foods that are high on fats and sugar, can become a safe way to detox and part of your daily lifestyle in maintaining good health. Widely used by many cultures, the sauna has become a regular part of detox. A great method of removing chemicals build-ups in fat cells, saunas are usually combined with diet, exercise and nutritional supplements. Skin brushing is another gentle way of detoxing. Used with a combination of diet, exercise and nutritional supplements, it removes old skin cells, stimulates the lymph system and draws out toxins through the skin. A dry skin brush made of soft vegetable bristles, which can be purchased from most good health and beauty stores, should be used. Before taking a shower, start with your feet, lightly brushing them in a circular motion gradually moving upwards towards the chest area for a minute or two. Breathing exercises, as practiced in yoga, lets the bloodstream thoroughly oxygenate thus supplying more energy and improving the body’s physical process. The many different positions lightly massage the internal organs and stimulate them to slowly discharge toxins. The detox cleansing methods listed above are just a guide to what they can do to improve your health, but I hope they explain why it is necessary to understand how detox plays an important part in maintaining a healthy body and the different ways on how to detox the body before you begin with the different programs. Are there Alternatives to Detoxification Methods? There are many diehards who insist that detoxification methods and programs are the only way and essential in keeping your body clean of foreign substances and making yourself healthier. However, there are plenty of other ways to accomplish these same goals without going through specific rigorous and intense detoxification instructions. Even though detoxification methods have proven themselves effective, and thousands of people do adhere to them, here are some other detoxification methods that you may or may not have thought about. Used by very many people throughout the world, and now popular in Western society and the United States. Aromatherapy is a very old practice based on the principle of breathing in vapors and scents of certain aromas that will help the body rid itself of the toxins. These specific aromas can usually be purchased at health food and other grocery stores, many of whom will give you advice on the various oils and fragrances used in aromatherapy. One of the most relaxing uses of aromatherapy can be while giving yourself a hot bath. People believe that by adding the oils and vapors directly to the water that you’re soaking in then the toxins in the body will leave once the water, vapors, and oils are soaked into the skin, as well as breathed in through the nose. Aromatherapy definitely is an interesting alternative to following rigid detoxification methods, though, and there are people all over the world that claim that it works just as well, if not better. Acupuncture, like aromatherapy, was used in Eastern societies many centuries ago , and still is today. It is now widely accepted in Western societies today as an alternative to conventional medicine in treating many common ailments and to bring good health to everyone. Acupuncture, the science of placing needles in the skin, has something to do with the pressure points on the body and can be used as an alternative to detoxification because it is believed that the needles placed in the right place will be able to relax and detoxify the body. There are all sorts of people who perform acupuncture on a regular basis, and many people contend that acupuncture is an excellent alternative to drinking natural juices, soups, and other raw vegetables for a whole week, which is what many detoxification methods require. As we have already established, studies have shown that people who engage in healthy diets, whether they be for weight loss or otherwise, will be far healthier than others who continue stuffing their face with fast and junk food. Putting yourself on a healthy diet will probably benefit you more than any other detoxification method ever could simply because you are not restricting yourself to what you can eat. On the other hand, detoxification methods usually call upon the body to give up food for one or two days while pureed and blended juices need to be digested. All in all, though, these are some definite alternative detoxification methods that truly work. Even though many people still engage in detoxification methods because they work, it is certainly nice to know that there are other alternatives available. As ever, the final choice is yours, whatever you decide that suits you best, stick with it. Just one word of warning! It’s no good sticking all week to whatever way you decide to detox then hitting the local bars on a Saturday night and finishing up in the nearest fast food joint scoffing cheeseburgers and fries, you’ll undo all the good you have achieved in a week in a couple of hours. Water – Which Is Best?